Propaganda for a No-Fly-Zone by the "Syrian Network for Human Rights"
"Barrel bombs" are weapons of massive and indiscriminate damage and civilian deaths, allegedly all made and deployed by Syrian government forces, dropped from aircraft (helicopters) on rebel-held areas. The way these crude but powerful explosives fall straight down from a hovering helicopters is widely described as "indiscriminate," and they point to the almost totally civilian death from attacks described as done with barrel bombs. Pro-intervention activist reports have such attacks happening on a near daily basis in 2014 and 2015, using the charges increasingly as a reason for an imposed "No Fly Zone" over at least parts of Syria. From March 2015, increasingly the accusation was expanded to barrel bombs that disperse chlorine gas, dropped on areas of Idlib and neighboring provinces, that had been "liberated" by Jabhat al-Nusra. There is adequate logic behind the basic idea of such a weapon, depending on its usage. 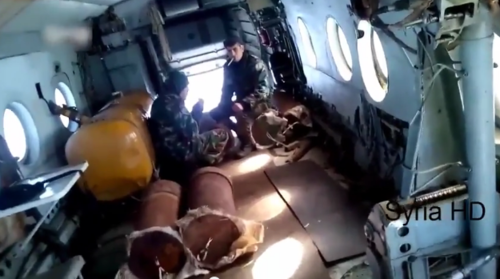 And there is some visual evidence of government forces indeed dropping explosives-laden barrels with welded tailfins from helicopters (some images or videos might be dubious or fake, but not likely all of them). However, when activists produce dead and suffering civilians in areas they administer, and claim it was one of these bombs that caused it, there is ample cause for skepticism. In many circles, that seems to get skipped over on the way to quick acceptance of the claim, and especially the central "fell from a helicopter" part of the story. 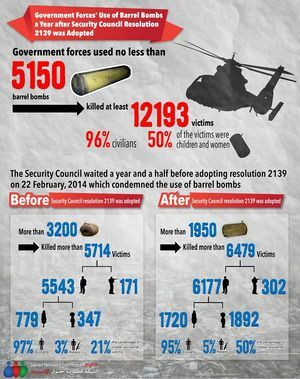 A BBC report offers a graphic summary; from January 2014 to March 2015, in attacks described as done by this weapon: 3,124 civilians killed vs. 35 rebel fighters. The attacks had also damaged 3 schools, 17 hospitals, and 23 mosques. War in Context: Assad denies using barrel bombs in Syria Shows a bomb-drop video, and a video of (claimed) on-the-ground effects. The quote in question: - Jeremy Bowen: What about barrel bombs, you don’t deny that your forces use them? - Bashar al-Assad: I know about the army, they use bullets, missiles, and bombs. I haven’t heard of the army using barrels, or maybe, cooking pots. - Bowen: Large barrels full of explosives and projectiles which are dropped from helicopters and explode with devastating effect. There’s been a lot of testimony about these things. - Assad: They’re called bombs. We have bombs, missiles and bullets… There is [are] no barrel bombs, we don’t have barrels. If here completely denying barrel bombs, would he respond to a precise description of them with "they're called bombs," or with something like "they're imaginary"? The "gotcha" quote here is "there is no barrel bombs, we don't have barrels." But he also seems to acknowledge they do, just making issue of the barrel part - they're called bombs, he says. It's a questionable distinction, and easy enough to misread into a flat denial. He would still deny, and perhaps with good reason, that they're killing hundreds of civilians as claimed. When they talk about barrel bombs, what are barrel bombs? It's just a title they use in order to show something which is very evil that could kill people indiscriminately, and as I said, because in the media "when it bleeds, it leads." They don't talk about bombs; they call it barrel bombs. A bomb is a bomb, what's the difference between different kinds of bombs? All bombs are to kill, but it's about how to use it. When you use an armament, you use it to defend the civilians. You kill terrorists in order to defend civilians. That's the natural role of any army in the world. When you have terrorists, you don't throw at them balloons or you don't use rubber sticks, for example. You have to use armaments. So, it's not about what the kind of armament, it's about how to use it, and they want to use it that time to accuse the Syrian Army of killing civilians. Syrian helicopter dropping barrel bombs on Qusayr in October 2012. Jisr Al-shughour - video for a pilot from Syrian Arab Army forces throwing barrel. bombs on terrorists May 24, 2015 - at least three dropped on a mountainous area, seen being shoved out of the helicopter and then falling. Still at right. killing 12,193 people, 96% civilian. But it also breaks this in half, before UNSC resolution 2139 (Feb 22) and after. It shows less bombs were used after the resolution, killing more people, including more than 4 times as many children as before. They say 50% of the 12,193 killed is women and children, but only the latter half is. The earlier half was only 21%. The real average is about 39%, and 61% are adult males. May 31, 2015 REF/RL "(the SOHR) says it has documented 17,000 barrel bombings by the Syrian regime since October 2014." Middle East Eye, 14 August 2015: "Syrian forces have dropped more than 2,000 barrel bombs across the country since July, killing hundreds of people, the US ambassador to the United Nations said on Thursday. ... "The Assad regime has apparently grown reliant on the repugnant use of barrel bombs as an instrument of terror against innocent Syrian civilians," Power said in a statement." VDC whole war, bombing with "barrel" in notes = 7,578 killed. 217 non-civilian men, of 7,361 civilians. These are 1,098 women (15%), 1,276 boys (17%), 734 girls (10%), and 4,258 men (58%). This page was last edited on 27 April 2018, at 20:57.